Driving tour of the battlefield. General Charles Lee at Monmouth: His Own Story. General Lee’s account of how he fought the first half of the first half of the battle. In his opinion, he deserved a medal for saving the day rather than being court-martialed for almost losing the battle. 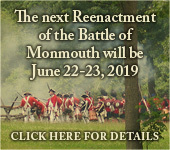 238th Anniversary of the Battle of Monmouth. Held at 1:30 PM at the Buccleuch Mansion, Buccleuch Park, New Brunswick (located on Easton Ave., New Brunswick, NJ 08901). Program on the role of the New Jersey Militia in the Battle. Program on the role of General “Mad Anthony” Wayne in the battle of Monmouth. He was the most active and maybe the best officer on the field. Meeting held at 7 PM at the main branch of the Monmouth County Library, Symmes Drive, Manalapan. Date moved from October 5.